Next, the McLaren video takes us to a variety of test sessions, starting with a look at the first meeting between the MP4-12C and FIA Formula 1 Drivers' World Champions Lewis Hamilton and Jenson Button. This short video of the two racing champions tearing around Goodwood Motor Circuit is followed by a look at these two famous racers taking the new McLaren through the paces at the 2010 Goodwood Festival of Speed. Both of these segments with Hamilton and Button give us a great look and listen at the new McLaren supercar in action with plenty of interior and exterior shots backed by gobs of engine sound and screeching tires. Finally, the video heads to Dunsfold (the regular filming home of the BBC hit show Top Gear) for some high speed snow testing – because what good is a supercar if you can’t hit triple digits on a snow-and-ice covered road? Regardless of whether or not it is a good idea, this last segment continues to show off the performance of the new McLaren MP4-12C before ending the video with a series of dramatic statements from those involved in the testing. The 2011 McLaren MP4-12C is powered by a 3.8L twin turbocharged V8 churning out 600hp and 443lb-ft of torque and this new supercar carries a price of $229,000. If you have a quarter-mil laying around and want to get your hands on one of these, time is limited as McLaren plans to make no more than 1,000 units for the entire world. 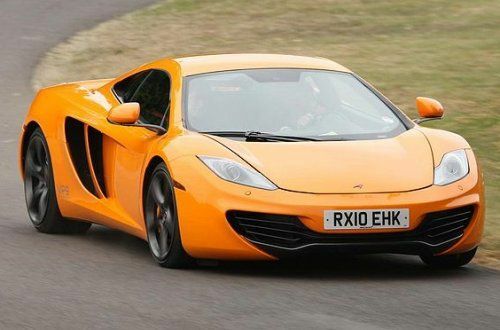 Click here for more technical and pricing information of the McLaren MP4-12C.